Normal Miguel by Erik Orrantia is a beautiful story of a young man’s journey of self-discovery and self-acceptance. It is an extremely well written novel that transported me to the rural hills of Puebla and the impoverished rural Mexican village of Comaltican and into the lives of not only Miguel and Ruben, but also the many colourful secondary characters that make up this community. The prose is simply gorgeous – I cannot stress this enough – and the author’s rich descriptions evoke a kaleidoscope of images of the people, community life, and the land. “In the dark of the evening, while the water from the heavens saturated the hills and the soil and the roots of every tree, the mountainside exploded. The gigantic rock which was the hillside above the cave opening came down in one piece, shattering against the earth into boulder bigger than burros that rolled down to places where they wedges between mighty trees and larger stones left there from the mountain’s previous madness. Water spewed out as if escaping from a cage. The groaning dies down as if the mountain was finally relieved, but the water continued to gush steadily with less pressure but greater quantity. 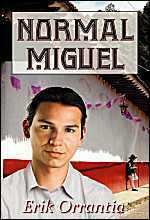 The story is written mainly from the perspective of Miguel and his narrative voice is one that is gentle and thoughtful. There is fluidity to the writing that allows Miguel to seamlessly take the reader from present to past and back again throughout the novel without interrupting the overall rhythm of the story. The author deftly captures Miguel’s nervousness as to whether he will be a good teacher and be accepted by his students and the community, as well as his fear at their reactions should they discover that he is gay. Throughout his year at the Internado (boarding school), Miguel both teaches and learns. His relationship with Ruben, and his experiences with his students and the people of the community prove invaluable life lessons that all contribute to his growth and maturity, and ultimately to his self-acceptance. The secondary characters in this novel simply jump off the page. The author’s treatment and presentation of them is quite unique in that he provides a brief back story for several of the recurring secondary characters that gives the reader insight into each character’s actions and motivation. While some readers may find this distracting from the main story, I felt that this only added to the overall richness of the story and its ensemble cast. Normal Miguel was an absolutely wonderful reading experience for me and I highly recommend this novel to readers. I very much look forward to reading more of Mr. Orrantia’s work in the future. Normal Miguel by Erik Orrantia is available in e-book format at All Romance eBooks, the Amazon Kindle Store and Rainbow eBooks through Bristlecone Pine Press, and in print at Amazon through Cheyenne Publishing. This entry was posted in Fiction, Indie Reviews, LGBTQ, Literature, Rainbow Reviews, Romance and tagged Bristlecone Pine Press, Cheyenne Publishing, Erik Orrantia by Indie Reviews. Bookmark the permalink. Was just checking out your website so I thought I’d subscribe. You do keep yourself busy, don’t you? Thanks again for the wonderful review! Yes, I do try to stay busy, keep myself out of trouble that way. Thank you for subscribing, I’m also reading your blog. It was a pleasure to read (and review) Normal Miguel. Once again, congrats on the Lambda Literary Award for the novel.